We offer over 120 classes every month, all at no additional charge for our members. Group exercise classes are a great way to keep you focused and keep your intensity up during your workout. You'll be surprised at how fun it can be to work out in an intense and organized class versus working out out on your own. From cycling to step to abs to yoga: our classes are all taught by certified instructors who are excited to help you meet your personal fitness goals. We offer classes Monday - Saturday at a variety of times throughout the day and night. Ab's Class: Focus is on the abs and core. It's a short but intense alternative to your regular ab routine. Fit Mix: A constantly changing mix of cardio & strength interval training. A total body workout! 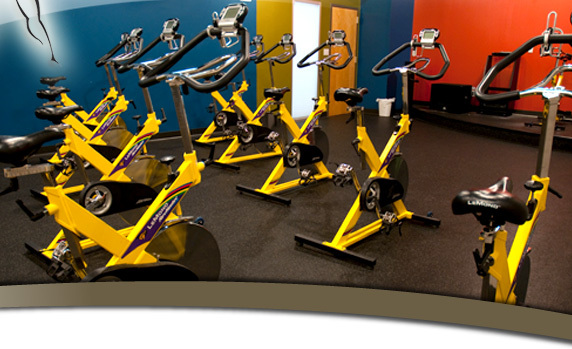 Cycling: A motivational group cycling experience that will burn a minimum of 400-500 calories. Fitonergy: A boot-camp style cross-training workout like you've never seen before. Hard-Body Yoga: A more intensified class that incorporates strength using your own body weight. Step Aerobics: Designed to be a low-impact, higher intensity alternative to floor aerobics. Yoga: A 60-minute stretch class focusing on meditation, coordination, and balance. Turbo Kick: A great kickboxing routine. Music and moves change with each round. Tummy & Tush: aka T&T, it's a 30 minute class focusing on those troublesome areas. Powerball: Build core strength and flexibility using stability balls. Power Weights: A more advanced and intense take on Body Sculpting.